The Explore Data Science Academy at the Bandwidth Barn in Cape Town. 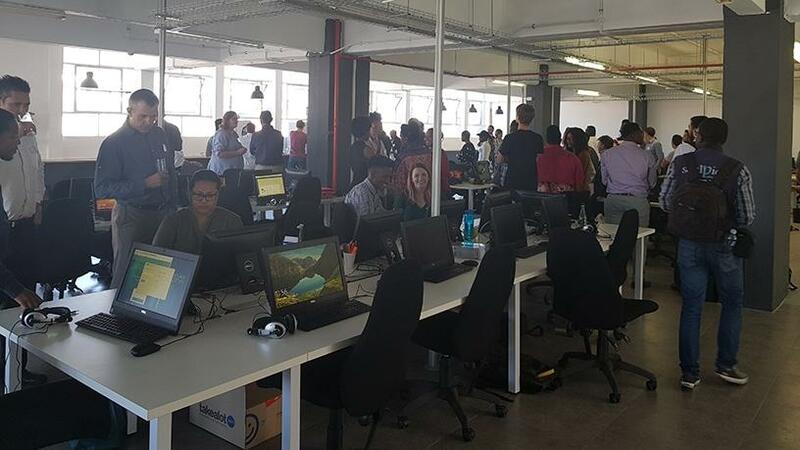 Johannesburg will be the second home of the Explore Data Science Academy, when the institution expands and adds 300 more students to its pool of learners next year. The academy, currently based in Cape Town, is reportedly the first institution in the country focused on data science skills. It was founded by qualified data scientists Shaun Dippnall, Dave Strugnell and Aidan Helmbold. BCX is the current sponsor of the academy, having made a R50 million investment to train 300 interns (100 each year) over the next three years. In efforts to expand the programme, its founders say they are making plans to invite more sponsors to come on board and add an additional 300 more learners, before establishing an office in Johannesburg next year. Dippnall says the co-founders have been tasked with the mission to seek funds for the 300 students that will be enrolled next year. "So far we have been busy engaging banks and organisations within the insurance industry and most of them have indicated a strong interest. Sponsors can decide to either sponsor 100 or 50 students, depending on their budget. As an actuary by profession, I have worked at the bank and I'm aware that they need data scientists in a big way, as their need is high. "In around June and July, we will start the recruitment process for the 2019 pool of students. The criteria for next year's programme is that they must be aged 18 to 35, and have an attitude for solving problems. There is also an assessment phase where they will be required to write a bunch of tests." This year's participants are taught various skills involving using data to solve problems. This includes data mining, data analysis, visualising data and data communication, adds Dippnall. "There is a lot of maths, computer science, and statistics that must accompany that knowledge. At the moment they have started tackling the Cape Town water crises issue and have submitted their projects with recommendations, which will be assessed." At the end of the one-year course, those who have successfully qualified will get an opportunity to walk away with a learnership with BCX. This week the Cape Innovation and Technology Initiative announced a significant scale-up of its renowned CapaCiTi technology skills and job readiness programmes. The organisation says it has injected R250 million to train young, unemployed South Africans through the assistance of generous support from South African corporate businesses, including BCX, and the National Treasury Jobs Fund. SA is facing a shortage of data scientists, which the Harvard Business School dubbed the "21st century's sexiest job". For example, there are not enough data scientists in SA to handle the vast amount of data that will need to be interpreted when the Square Kilometre Array telescope is live. "In SA there is a shortfall of many thousands, if not tens of thousands, of data scientists, so we are pretty confident that if we are producing hundreds of data scientists in SA annually, they should get jobs quite easily given the shortfall," Dippnall points out. "The shortfall of data scientists has dire repercussions for local organisations because we are in a global economy and we are competing with global companies such as businesses in Silicon Valley. So if we do not have the right skills sets, we will compete less sufficiently and be beaten by our foreign counterparts."